Hi there! Happy Wednesday friends! Do you love to DIY? Are you looking for a fun way to spend some time with your gf's?? Have you heard about our 'Holiday Maker's Day' yet?!? This is going to be one amazing, super fun, creativity filled day! We will provide everything you need to custom create all 4 of these awesome holiday decor items (these make great gifts too!) 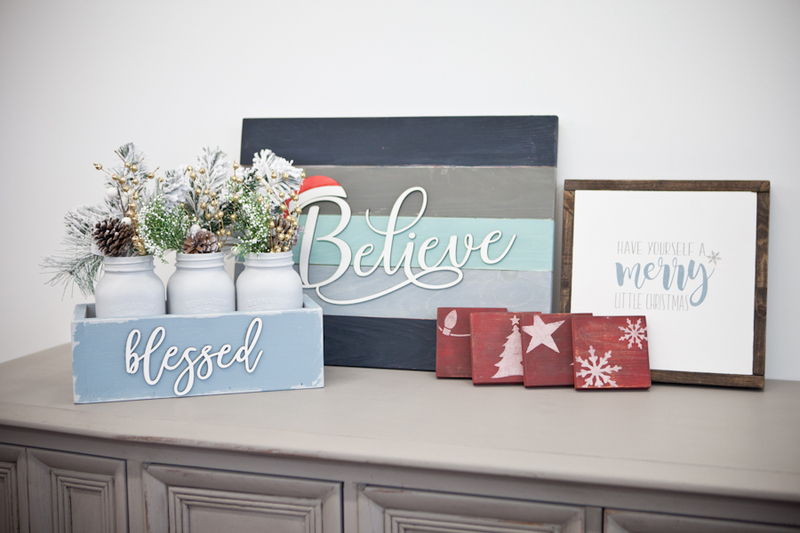 The best part is that you can customize all of these using whatever colours you like as we have our entire line of Miss Mustard Seed's Milk paint and Fusion Mineral paint available for you to play with! Didi I mention we will also be providing lunch and extra goodies, lol?? Go ahead and click here to see what it's all about (space is limited)! Ok, now that you've registered to join our Holiday Maker's Day - let's take a look at what'cha been workin' on, shall we?!? First up this week is a darling little dresser restyled by Kim. I love this look when a piece has nice straight lines like this! We often leave drawer fronts in the natural wood and paint out the framework (where most of the wear and tear usually is). Kim did a beautiful job on this using our Fusion Mineral paint in Coal Black. The drawer fronts were sanded down and sealed with a natural beeswax finish to protect! As you can see the finish on the top was quite worn, and even the drawer fronts needed some attention. Great job Kim - thank you for sharing with us! 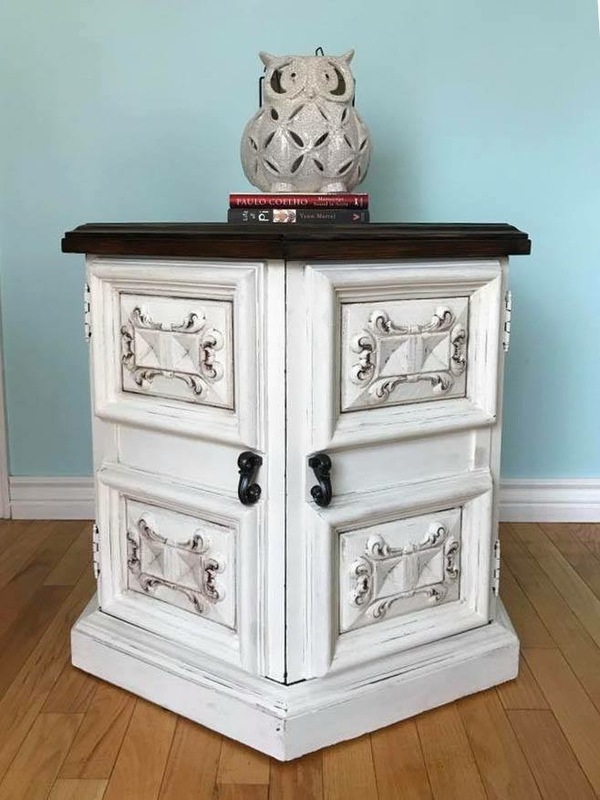 Next up this week is a sweet and soft restyled cabinet done by Sonya. This hutch looks so beautiful in new lighter colours! And I ADORE the wallpapered back on this, don't you?! Sonya did a fantastic job on this cabinet using our van Gogh Fossil paint in a nice soft 'chalk' white! 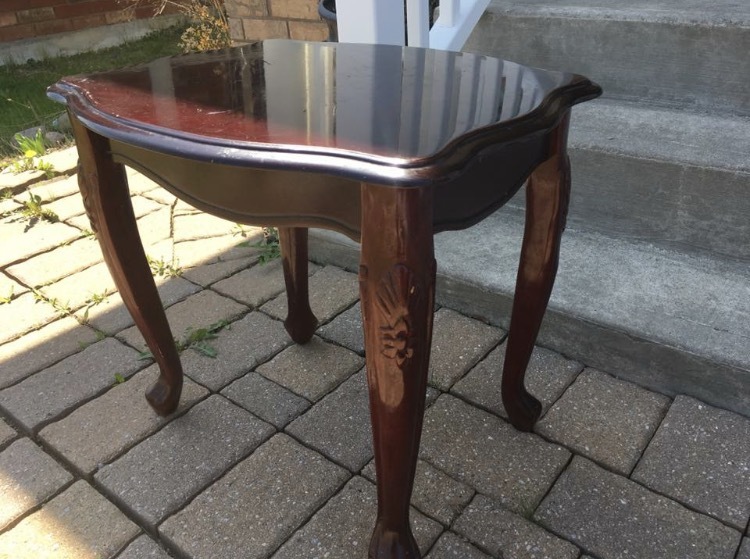 A bit of distressing and both natural and an antique wax really accent the details! Beautiful job Sonya! Last up this week is a gorgeous restyled secretary cabinet! Alison used our Fusion Mineral paint in 'Limestone' on the exterior of this piece and used our van Gogh Fossil paint in 'Patina' on the inside. The two colours look beautiful together and this secretary has never looked better! So pretty Alison - thank you for sharing with us! Thank you again to Sonya, Kim and Alison for sharing your great restyled projects with us! Can't wait to see what your working on for next week! Happy painting! For those of you with little ones that have gone back to school . . . congratulations! You've finally got some time to paint that project you've been thinking about, lol! Oooh and fall is in the air - there's nothing like the pang of September and a slight crispness in the air that gets me itching for a new creative project! How about you?? 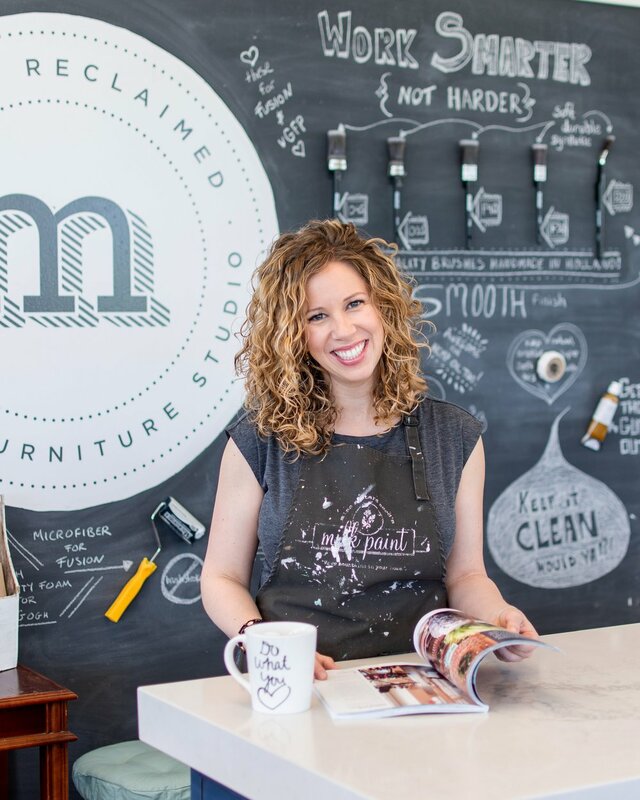 For those of you lucky enough to carve out some time over the summer to refresh your furniture, let's take a look at what'cha been workin' on, shall we?!? First up this week is a beautiful kitchen set that Lynne restyled. van Gogh Fossil paint in 'Zeppelin' grey looks great on this set, don't you think? Normally I'm not a big advocate of painting the chair frames and leaving the seats natural - with one exception . . .when the seats are a nice rattan like this. Great choice Lynne! I would have done the same thing - and the warmth of the natural rattan can now really be appreciated! Beautiful work Lynne - thanks for sharing with us! 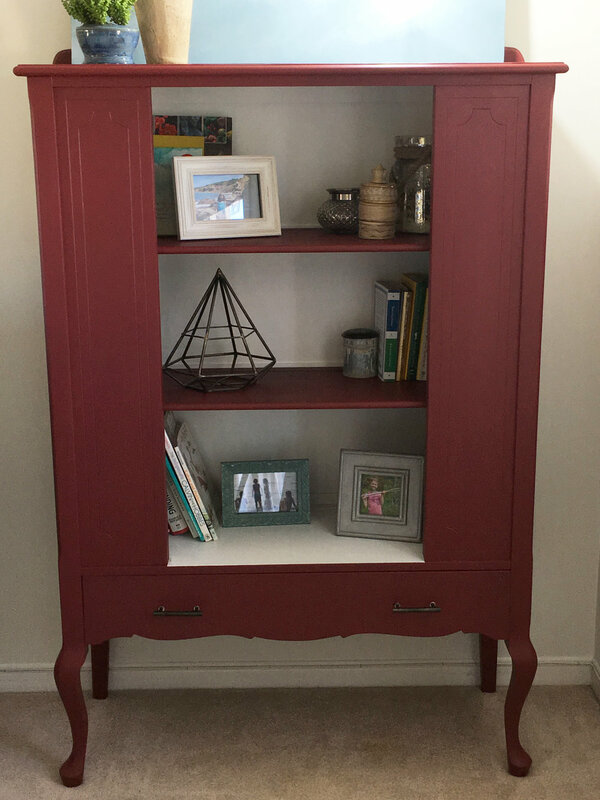 Next up this week is a sweet dresser restyled using Fusion Mineral paint in 'Champlain' by Sherri Ann! Wow this turned out fantastic! The top sanded out and re-stained looks incredible and the new hardware looks great too! 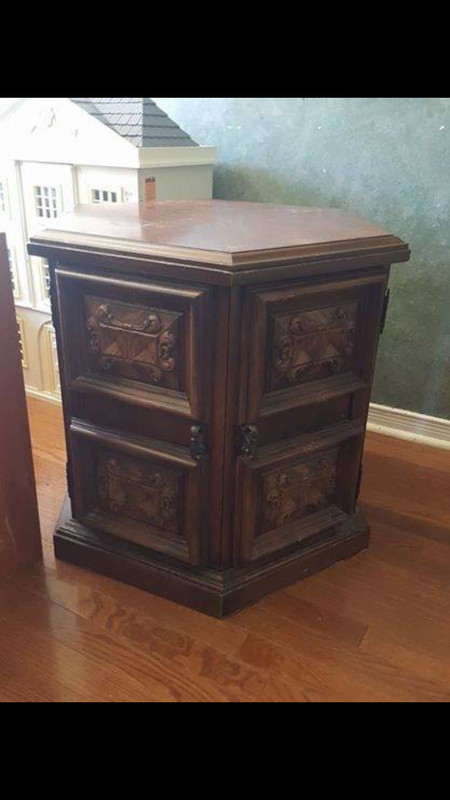 Here is a look at Sherri Ann's dresser 'before', as you can see it was in serious need of a restyle! 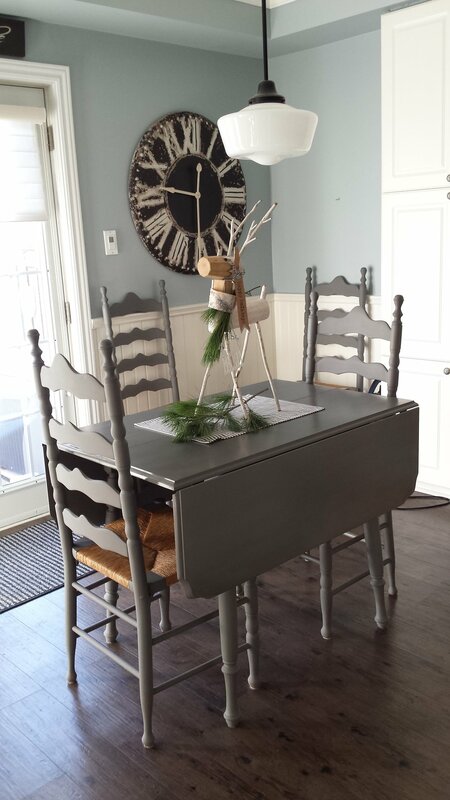 Beautiful work Sherri Ann - thank you so much for sharing your project with us! Last up this week, but never least is a super creative project by Rise! This beautiful and completely unique hall table was created using table legs picked up from the 'as is' inventory in our studio. Sometimes a small or unique space calls for a creative solution and Rise did a fantastic job with this one! Once her table was assembled (with a new top added), she painted the whole thing out in van Gogh's 'Cashmere' for a uniform and soft look. Stunning! Here's the part you won't believe - the before picture. 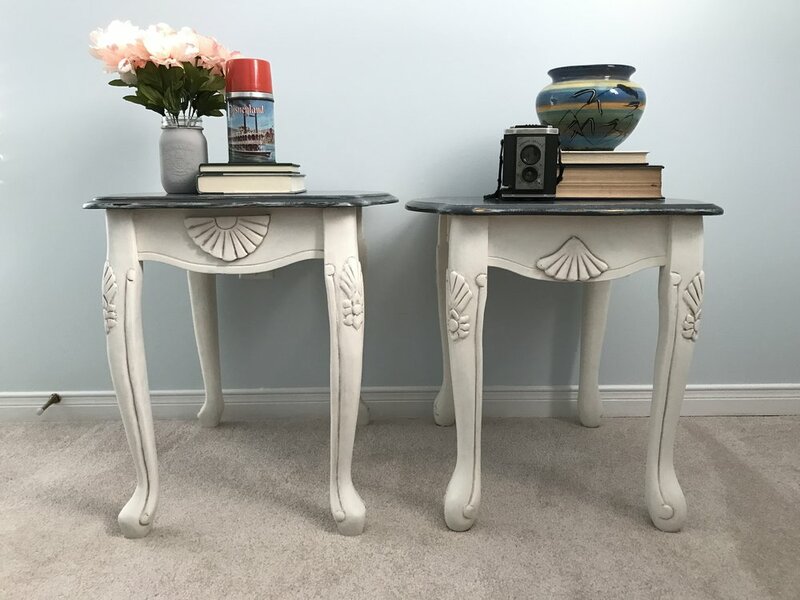 These legs were originally for a much larger dining table, but in the end they make the perfect pretty base to a custom made and painted hall console table. I love it! Thank you so much for sharing with us Rise! Such a beautiful project - so happy that you stuck with your vision!